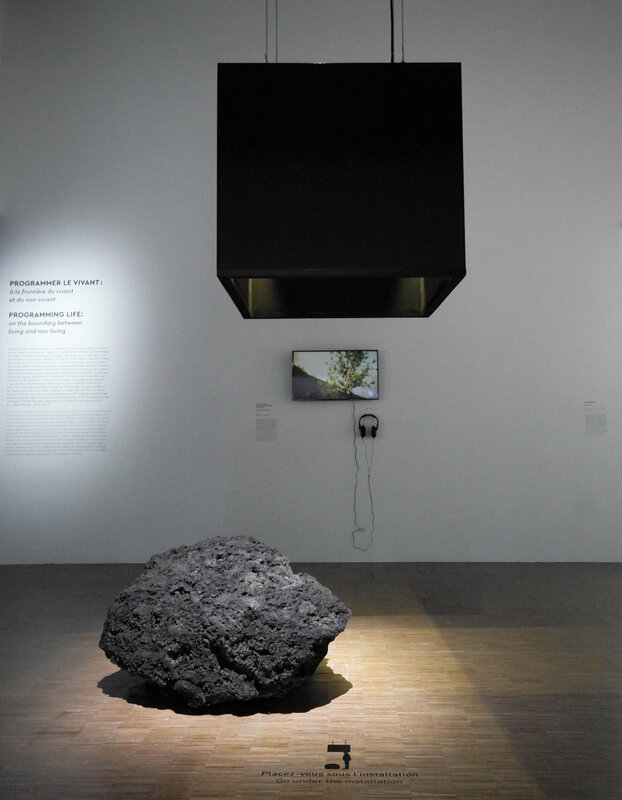 The third exhibition in Centre Pompidou’s Mutations/Creations series, after “Printing the World” in 2017 and “Coding the World” in 2018, “Designing the Living” explored the world of programming the living in the fields of design, architecture and contemporary art. As in previous years, the event was accompanied by Forum Vertigo, an annual cycle of international talks featuring artists, designers, engineers and thinkers. 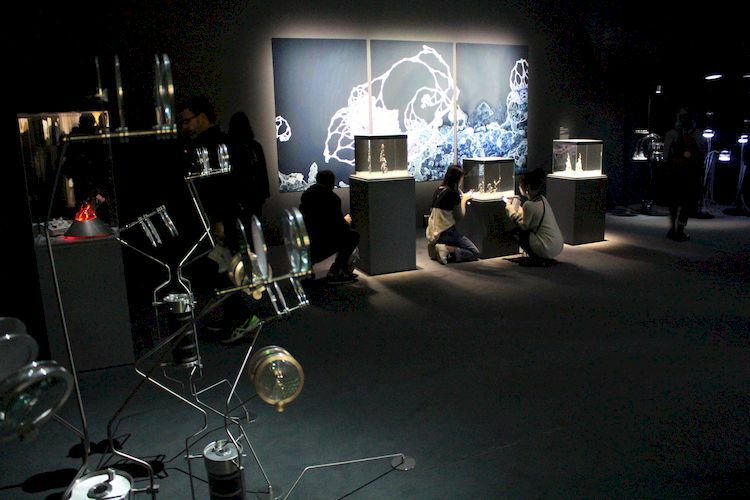 The ambitious exhibition attempted to retrace the links between biological research, biofabrication and biocomputation, leaning heavily toward biomimetics and artificial life forms. With the spectrum of a biennale, more than a hundred works were collected for this show, deployed in the unfortunately limited space of Gallery 4. The works themselves were placed so close to one another that some barely had enough space to breathe. Others, esoteric and photogenic, such as Amy Karle’s Regenerative Reliquary, were largely bestowed enough space to be “instagrammed”. Meanwhile, we were more intrigued by the smells and associated allergenic and sanitary risks of an arch made of mycelium bricks, which greeted visitors at the entrance. Another source of confusion was the curators’ determination to encompass and unify a field that by its very nature cannot be resolved through a unified vision. Even the introduction to the exhibition catalogue drowns in references, buzzwords and scientific jargon—also containing errors that might have been avoided with a sharper focus on content. The rest of the catalogue only evokes some of the fields covered by the exhibition. It’s the industrial prospective of Centre Pompidou’s Design department asserting its perspective, deployed within a timeline that feels more like a self-fulfilling prophecy. The more we immersed ourselves in this exhibition and its “exhaustive” chronology, the more we noticed its regrettable omissions: most notably French bioart pioneers Art Orienté Objet, or Joe Davis, another pioneer in the field, both winners of the prestigious Prix Ars Electronica in the Hybrid Art category, respectively in 2011 and 2012. Other inaccuracies popped up in the timeline: no, Eduardo Kac’s green rabbit is not phosphorescent but fluorescent; no, the researcher Audrey Dussutour did not “discover” Physarum polycephalum. And little space was given to vernacular bioart, open source and DIY cultures, critical views or ethical debate. We particularly missed the bioterrorism charge against Steve Kurtz of the Critical Art Ensemble collective in 2004, or Paul Vanouse’s works on the invention of PCR (polymerase chain reaction), DNA and the scientific construction of identity. 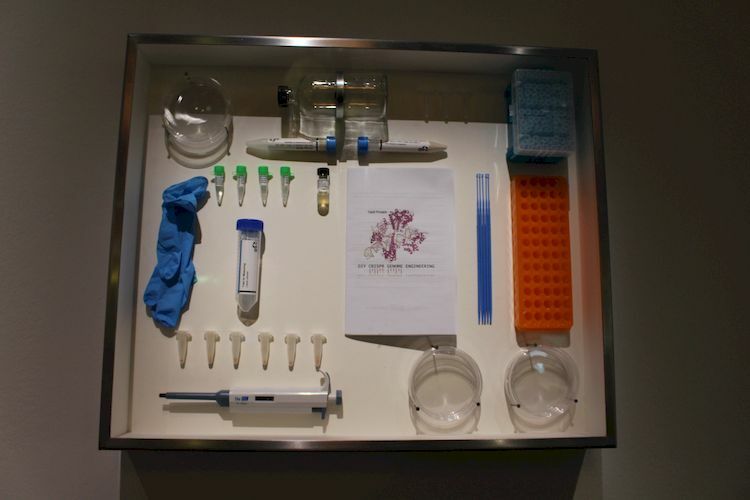 Finally, it seemed that the libertarian and entrepreneurial philosophy of Josiah Zayner and The Odin (whom Makery has mentioned many times) set the tone of the exhibition, as the timeline concluded with his CRISPR/Cas9 gene-editing kit, displayed as a “ready-made”—without any mention of the controversy that surrounds it. 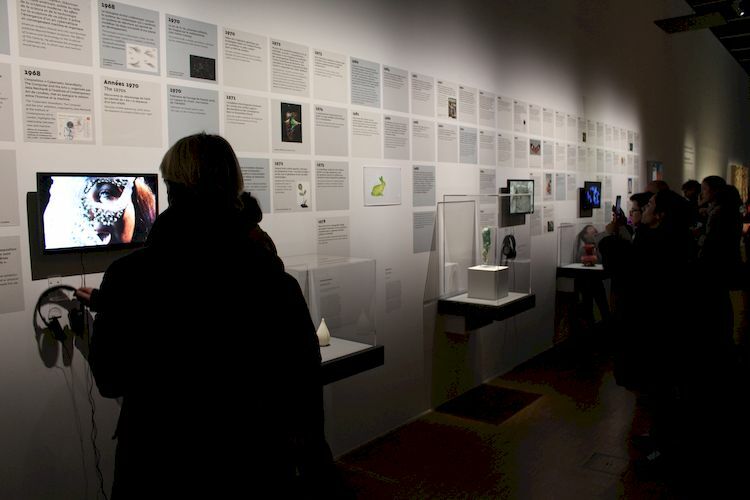 To be fair, this exhibition was curated by the Design department, and it is visibly driven by bio-inspired design. We appreciated seeing art-science explorations that Makery also covered over the past years: environmental researches by La Paillasse, Marie-Sarah Adenis and Lia Giraud; hormonal relations between humans and plants in Špela Petrič’s “hopeful monsters”; retro-engineering genetically modified flowers by Georg Tremmel and Shiho Fukuhara of the Tokyo BioClub. Out of over a hundred exhibited works, we can only describe a few of the most intriguing ones here. In this olfactory research done in collaboration with the biotech company Ginkgo Bioworks in Boston, the three artists resuscitate the lost scents of three flowers that went extinct in the 19th century: Hibiscadelphus wilderianus on Maui in Hawaii; Leucadendron grandiflorum in Cape Town, South Africa; Orbexilum stipulatum in the U.S. state of Kentucky. At Centre Pompidou, they presented the scent of Hibiscadelphus wilderianus, which used to grow in the former lava fields on the southern side of Maui’s Mount Haleakala before its forest habitat was destroyed for bovine cattle farms. The last living tree was recorded in 1912. Using DNA extracted from specimens of the extinct flowers that were preserved in the herbarium of Harvard University, Ginkgo Bioworks synthesized gene sequences that were likely to engender scent-producing enzymes. Building on this work, Sissel Tolaas reconstructed the scent in her laboratory, using molecules from identical or similar scents. Note that the result is only an estimate of the extinct floral scent, as the exact quantity of each molecule has also disappeared, making it impossible to know the exact scent. Ginsberg, Agapakis and Tolaas are buoyed by the current “de-extinction” debate among geneticists, whereby the controversial Harvard professor George Church is promoting the resurrection of mammoths and other extinct species. 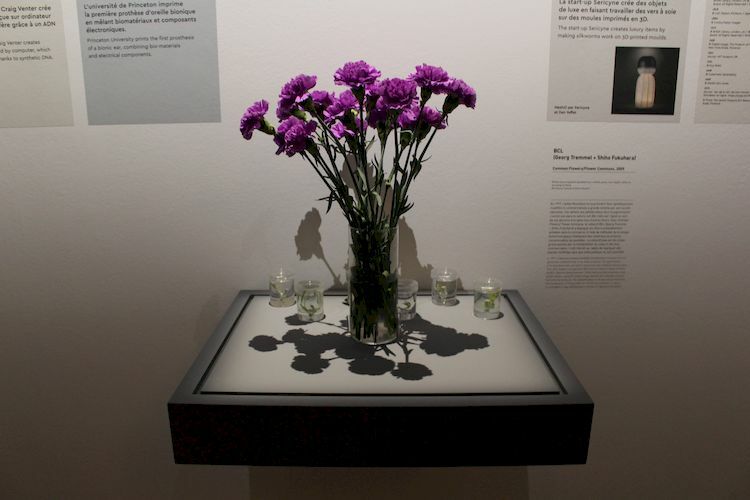 The three artists, however, are less interested in reversing extinction than in using our sense of smell, volcanic rock from the original location and digitally reconstructed landscapes to reveal the interaction between a species and a place, neither of which still exists, to evoke the delicate beauty of an extinct floral scent. This work is also showing at the Design Biennale in Saint-Etienne, France, through April 22, 2019. 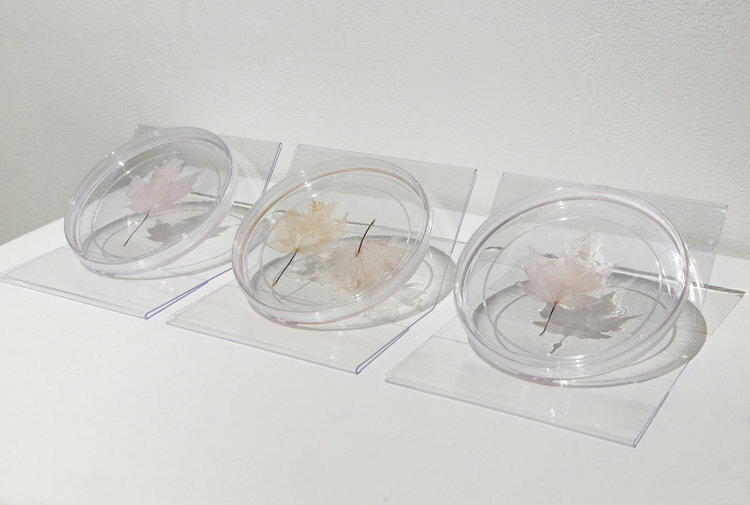 Lungs of the Earth is a series of Petri dishes containing decellularized maple leaves cultured with human lung epithelial cells. 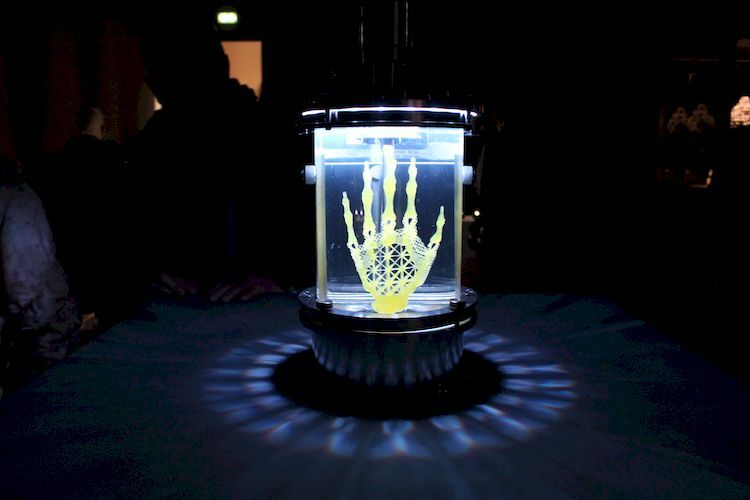 It was conceived and created by Canadian artist Elaine Whittaker with Ryan Hickey and Andrew Pelling at the Pelling Laboratory for Augmented Biology, University of Ottawa, where Elaine was an artist-in-residence. For this piece, the Toronto-based artist took inspiration from her mother’s experience of contracting tuberculosis in 1944 at the age of 20 and being treated for two years at a sanatorium in Quebec. Using the power of the human lung and cells from the epithelium, “re-coating” the surface of the organs, in this case, the lungs, the dead maple leaves come back to life, perfectly evoking the “lungs of the Earth”. 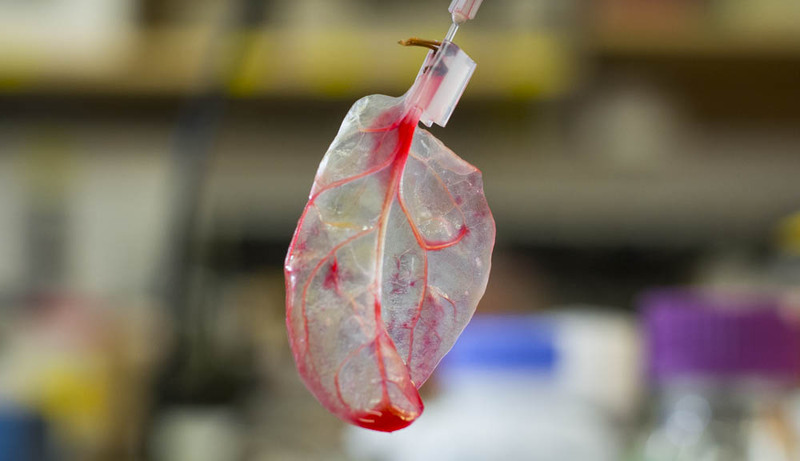 In 2017, researchers at Worcester Polytechnic Institute (WPI), at Wisconsin-Madison and Arkansas State-Jonesboro universities, used spinach leaves to develop cardiac tissue. Taking advantage of similarities in the vascular structure of vegetal and animal tissue, the researchers developed a decellularized vegetal tissue for tissue engineering applications. To do so, they profused a cleaning solution through the veins of the spinach leaf in order to get rid of the vegetal cells while preserving the (transparent) structure that keeps the cells in place. Then they filled the spinach veins with human cells that line the blood vessels. Human mesenchymal stem cells and cardiomyocytes derived from human pluripotent stem cells adhered to the exterior surfaces of the vegetable, while the capillaries carried all the necessary blood and nutrients to the cardiomyocytes. After five days of feeding the leaf, the cardiomyocytes received enough nutrients and became strong enough to contract like a muscle. The cardiomyocytes demonstrated a contractile capacity, as well as a capacity to treat calcium over a period of 21 days. Growduce is a cross between a biocomposter and a 3D printer, an appliance for recycling organic household waste into everyday objects through biofabrication. The base of the device, made of ceramic, hosts a colony of Acetobacter that live in symbiosis with yeast. The upper part of the device, a glass bell, allows the user to integrate waste and add various natural additives. The organic waste is incorporated and digested by the micro-organisms through a process of fermentation and metabolization that transforms them into a rubbery membrane that grows on the surface of the compost. 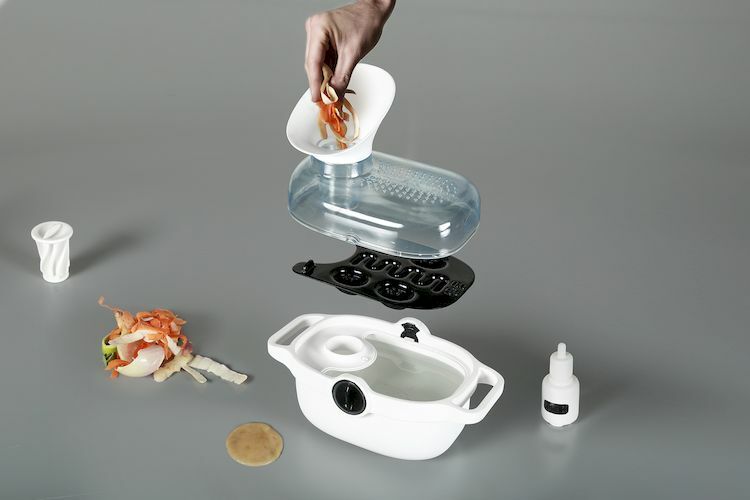 This provides raw material for the device to sculpt various everyday objects, using interchangeable molds. 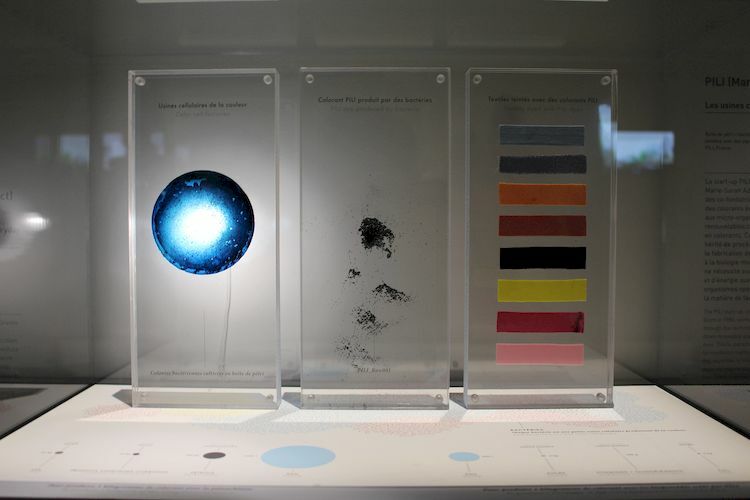 Using these primary recipes and molds, users can transform household biowaste into self-healing bandages, beauty masks, gloves and other clothing, or even new types of food. 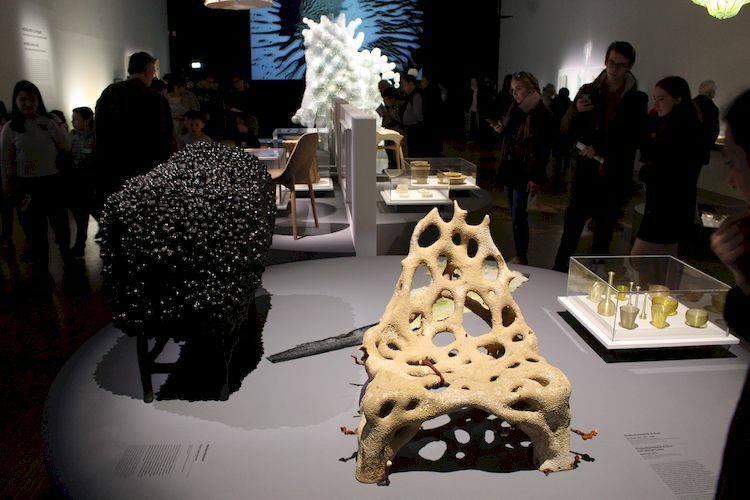 “Designing the Living” through April 15, 2019 at Centre Pompidou.